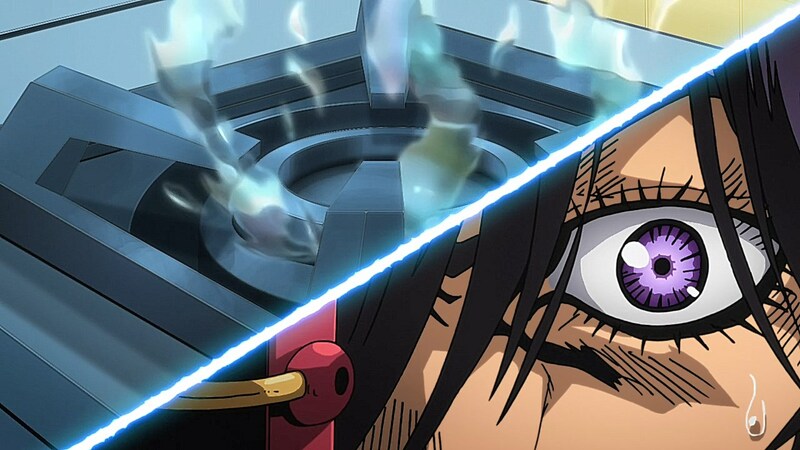 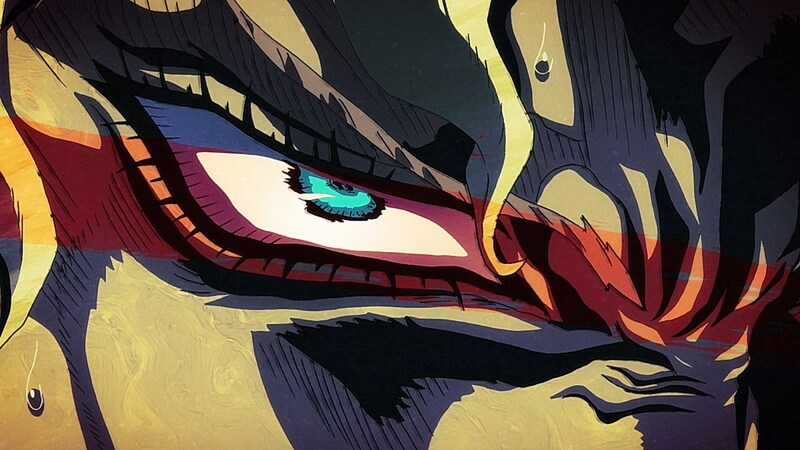 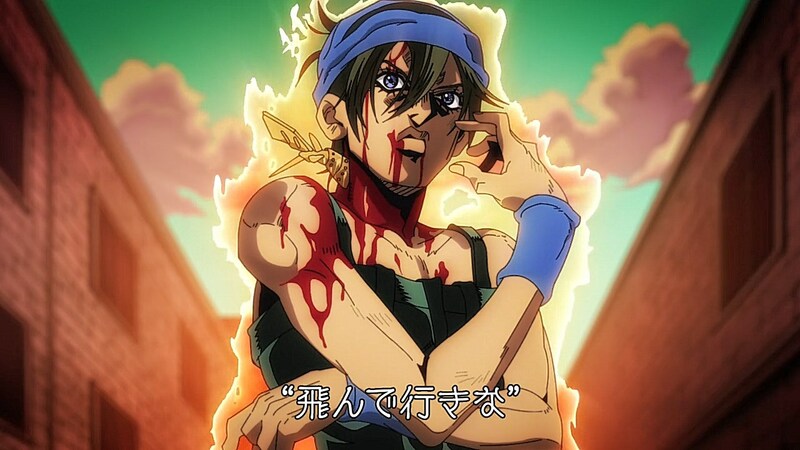 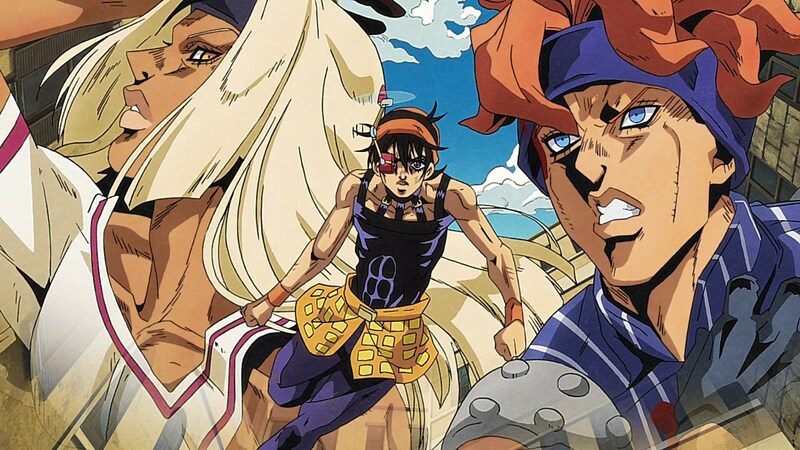 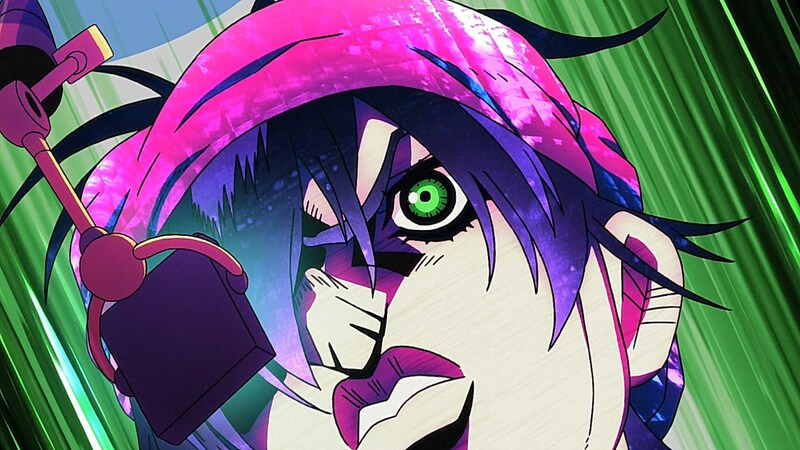 Episode 23 concludes the fight with Tiziano and Squalo by highlighting the strategy that Narancia has to undergo on his own to understand how Giorno operates, endure the trial-and-error mistakes that come with having to communicate with Talking Head and honing in on the duo’s overreliance on their stands’ remote functionality. 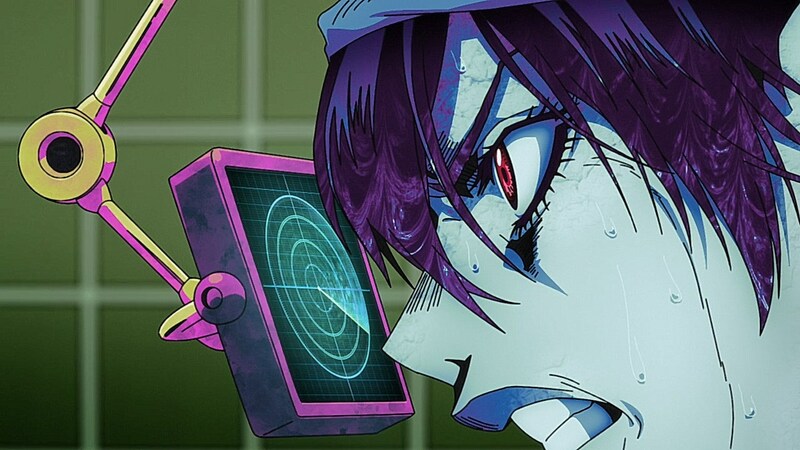 Part of the fun of this particular fight are the steps and conclusions that Narancia has to jump to interpret Giorno’s more cryptic hints. 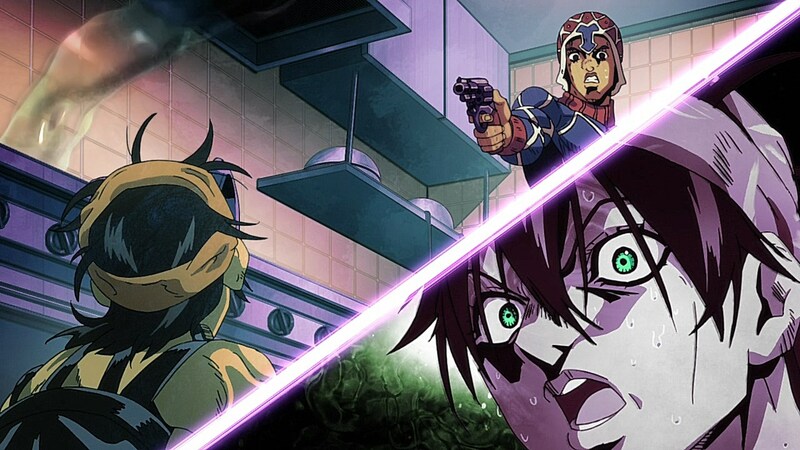 Because trying to communicate with his friends in Passione didn’t pan out, Narancia was only able to get Giorno to notice that much of his misdirection is the result of an enemy stand’s influence. 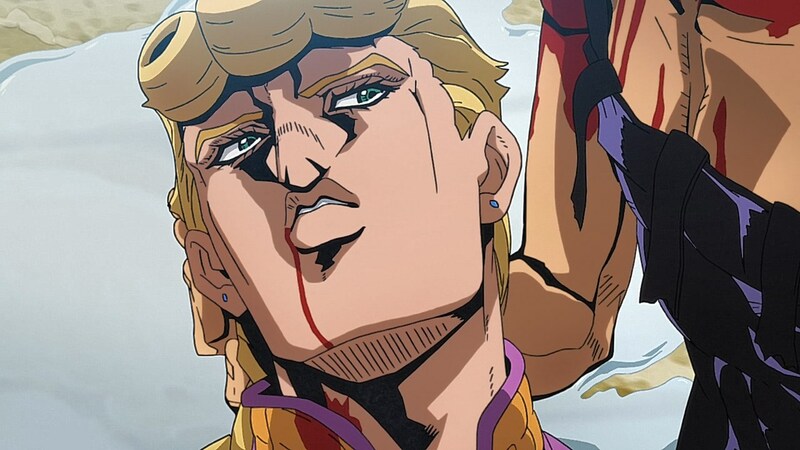 It was his direct experience with Giorno that helped him comprehend where he’s coming from and why he’s an important asset to Passione. 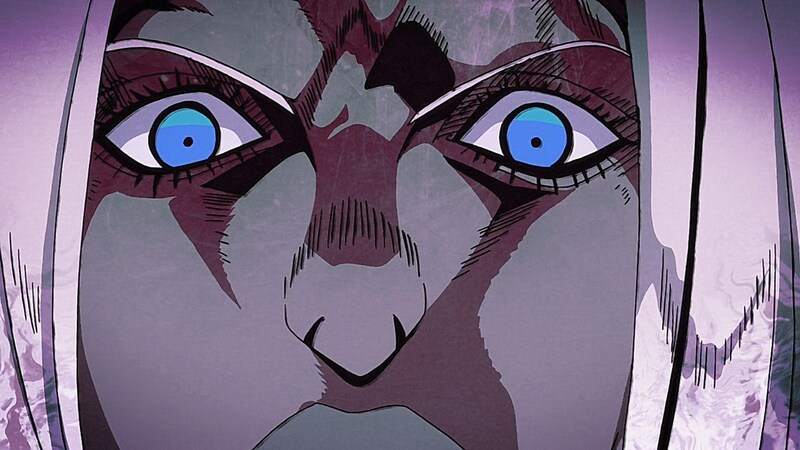 As opposed to Abbaccio’s open contempt for Giorno, Narancia is all-ears with Giorno taking the wheel with full trust in his judgment calls. 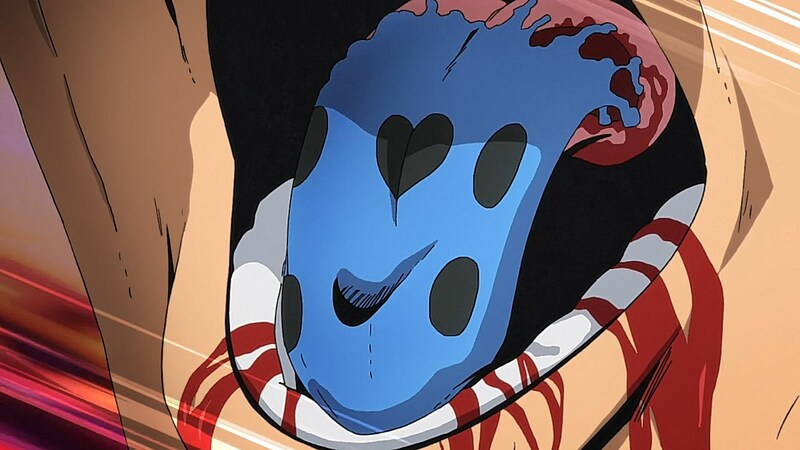 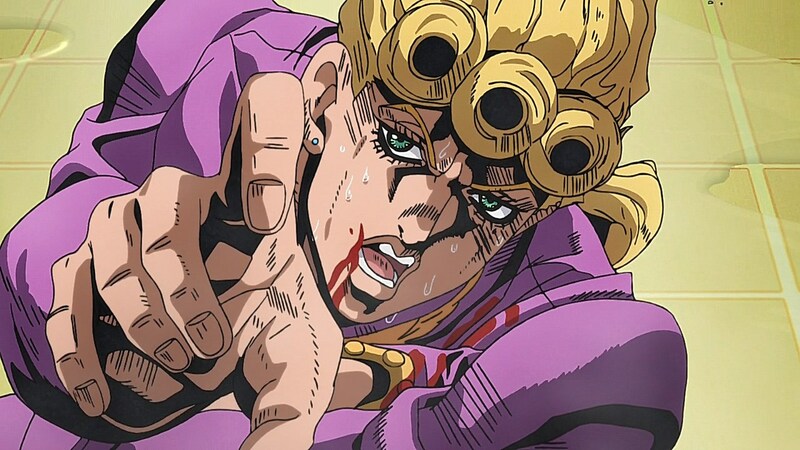 It helps that so many of the obtuse conclusions that Giorno jumps to end up working in Narancia’s favor such as having Aerosmith shoot his body so he can track Clash or using Giorno’s ladybug clip to construct a tongue so that he can be encouraged to remove Talking Head by slicing his own tongue off. 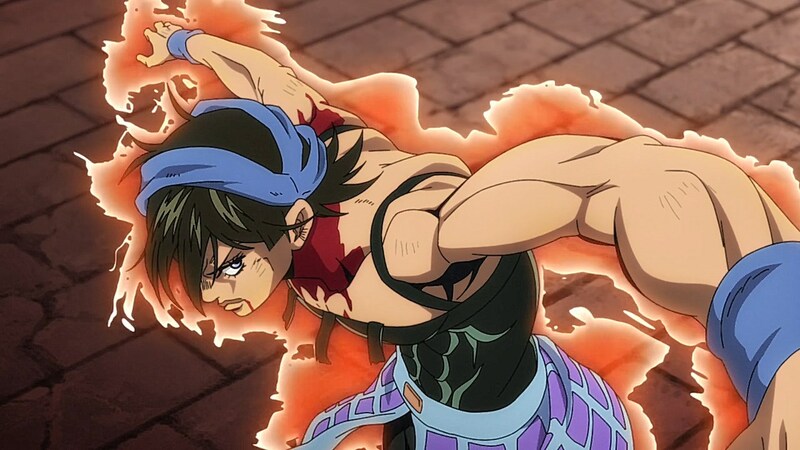 What the fight does well for Narancia is give him more of a purpose in Passione to show how he not only is able to operate on a competent level without having to overly rely on the instruction of others, such as when Fugo lectured him about the shopping trip, but also show us how well he synergizes with Giorno by picking up on his strategy towards fighting Tiziano and Squalo and utilizing his tracking abilities to their fullest extent to end the fight in a triumphant “Volare Via”. 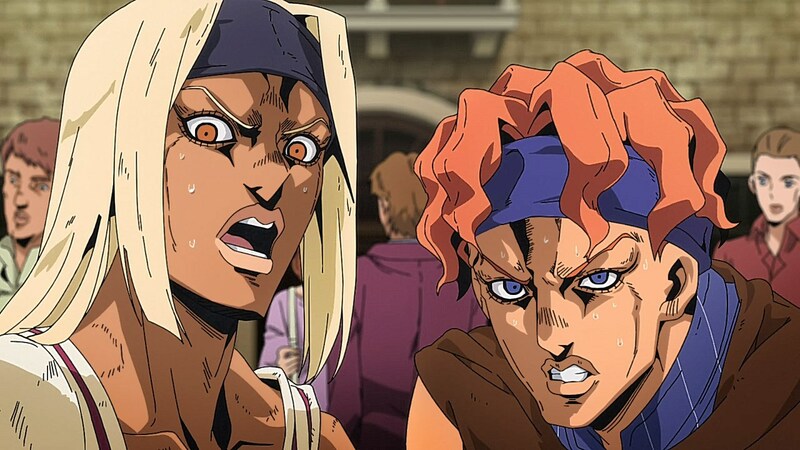 And speaking of the two, they’ve proven to be an interesting duo because of how strong they are as remote stand users. 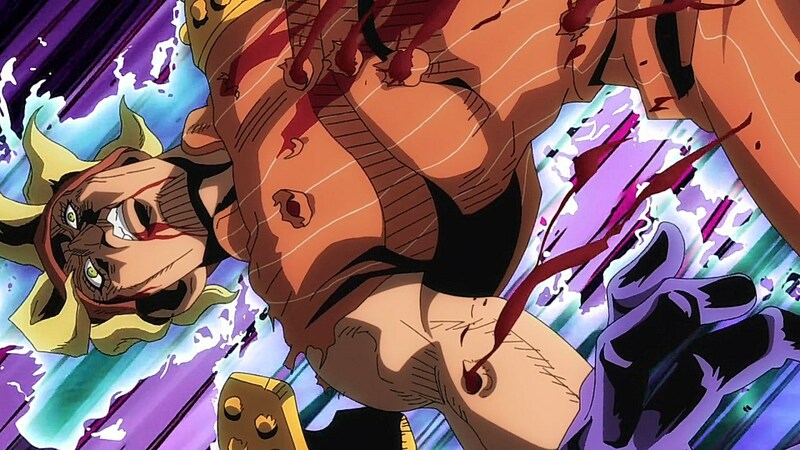 Although their largest Achilles heel is being dragged into a face-to-face confrontation, they are incredibly lethal when they use Clash and Talking Head from afar. 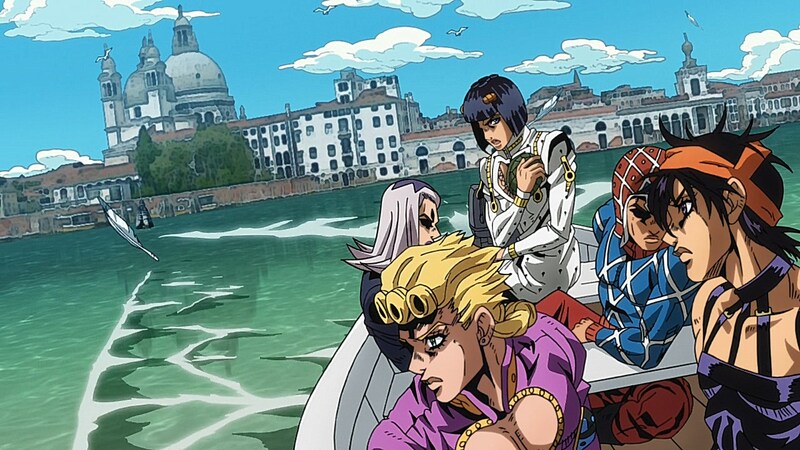 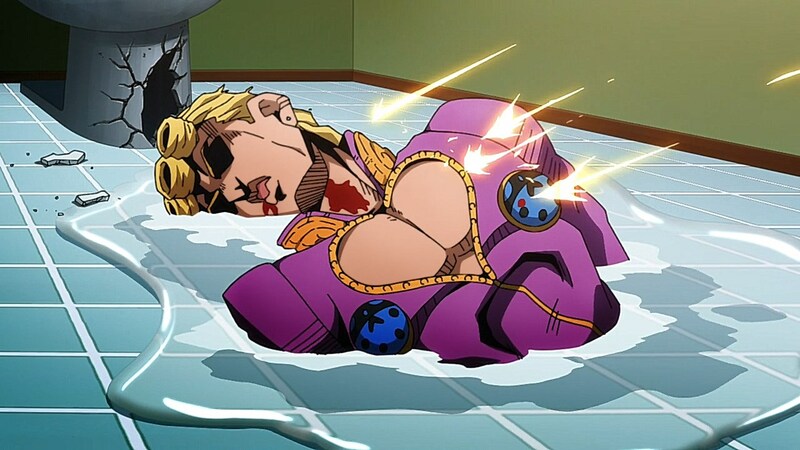 If it weren’t for Passione planning several steps ahead, they could easily catch a less equipped gangster off-guard with several of their traps. 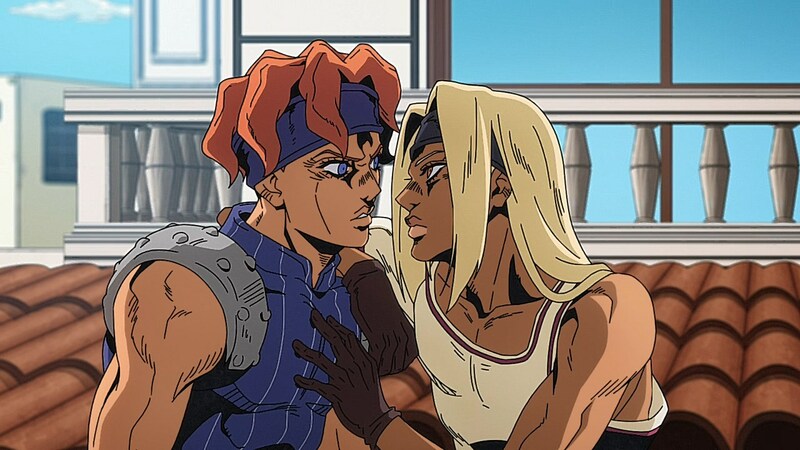 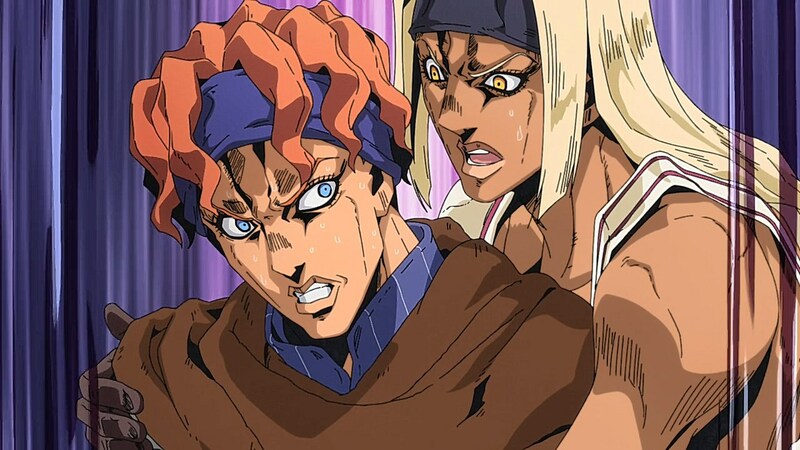 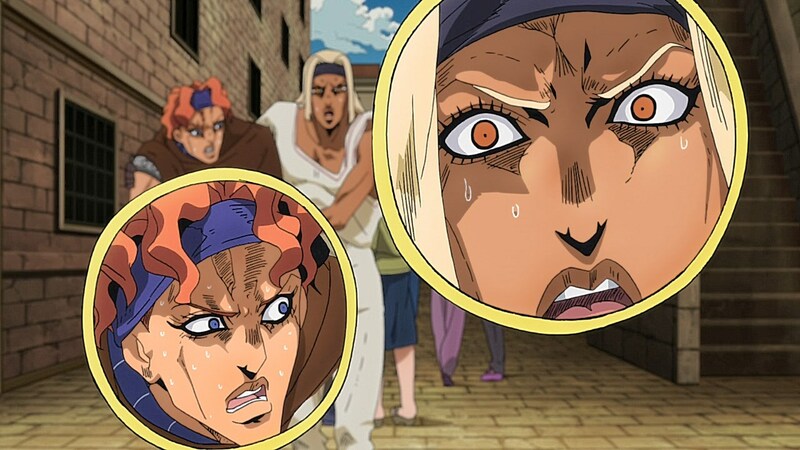 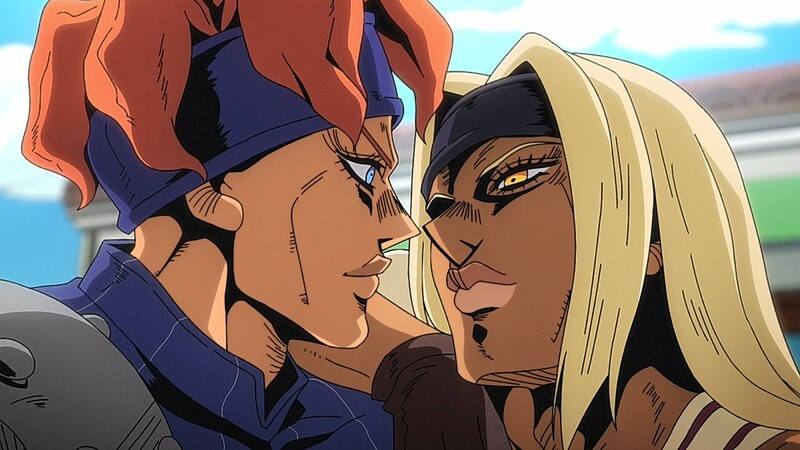 What also works more in their favor is the fact that they are a power couple, as Tiziano helps talk Squalo through some of his anxious thoughts when Narancia catches them in a pinch. 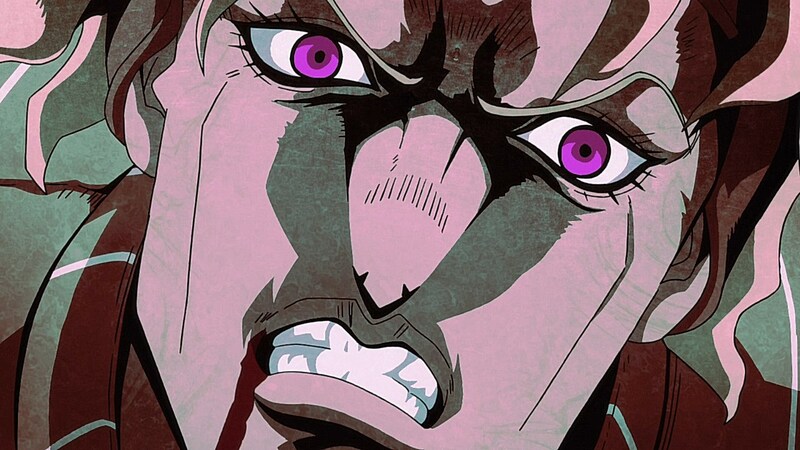 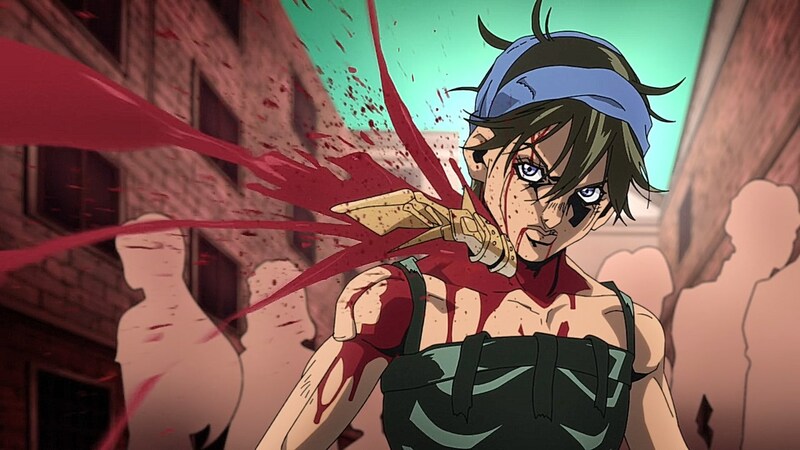 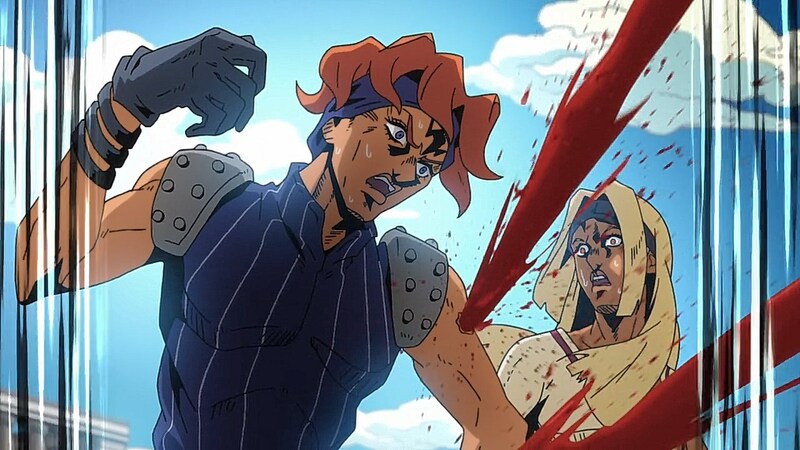 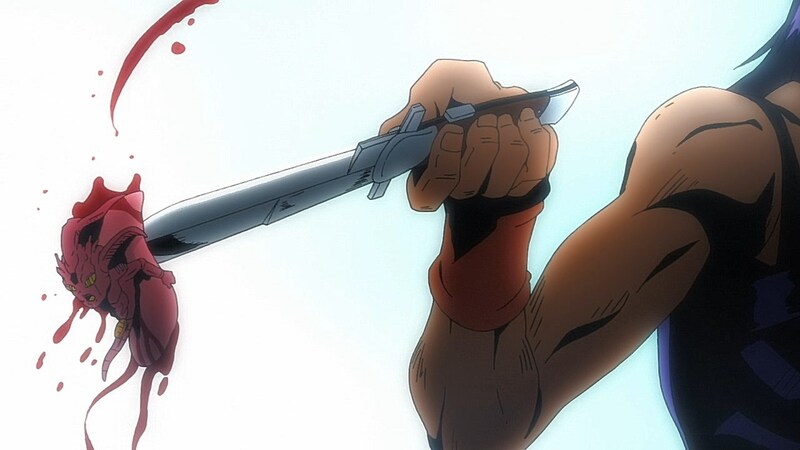 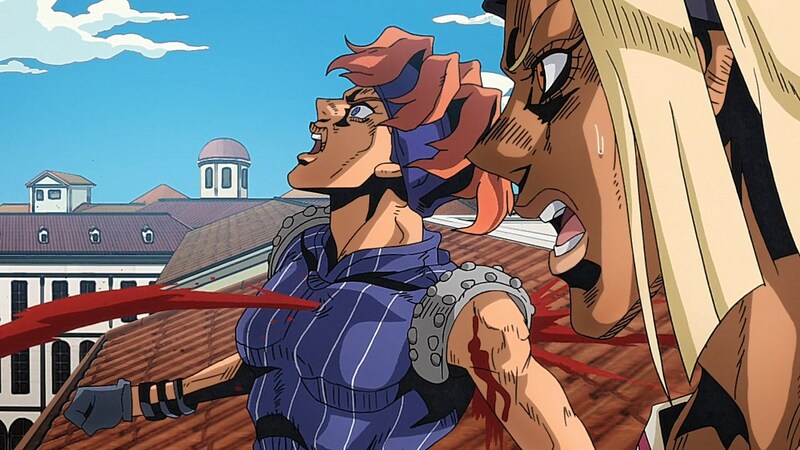 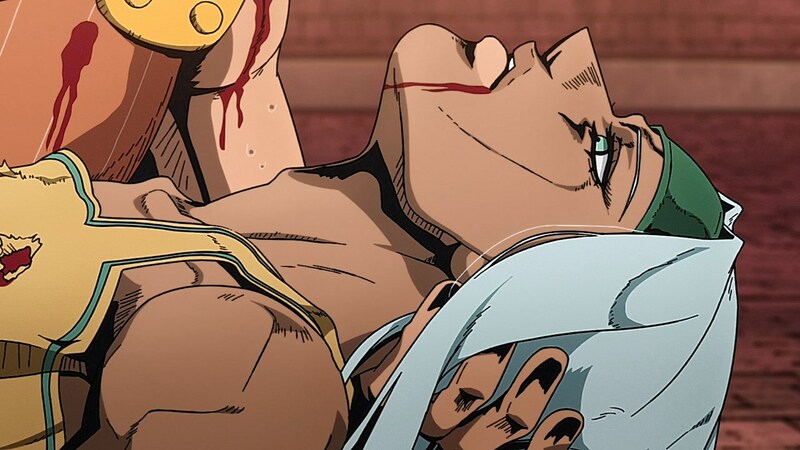 Even in Tiziano’s sacrifice, he did so to ensure that Squalo could use his blood to save himself and finish the job with Narancia. 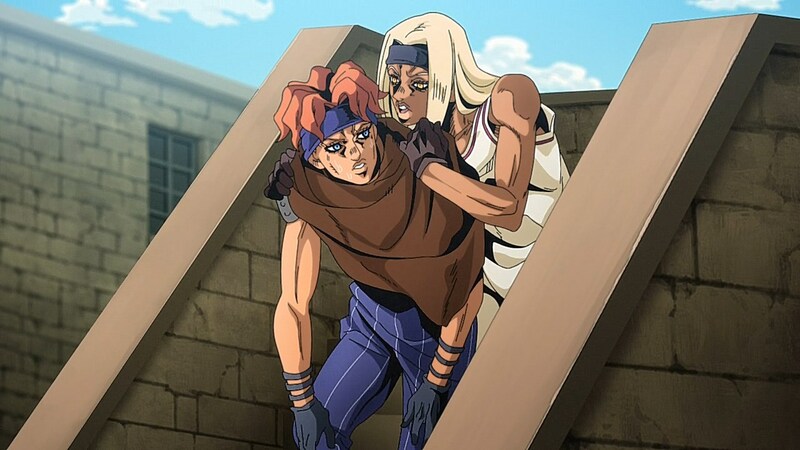 And unlike Pesci, Squalo’s anger about the death of his partner doesn’t result in him doesn’t cause a massive shift in his behavior. 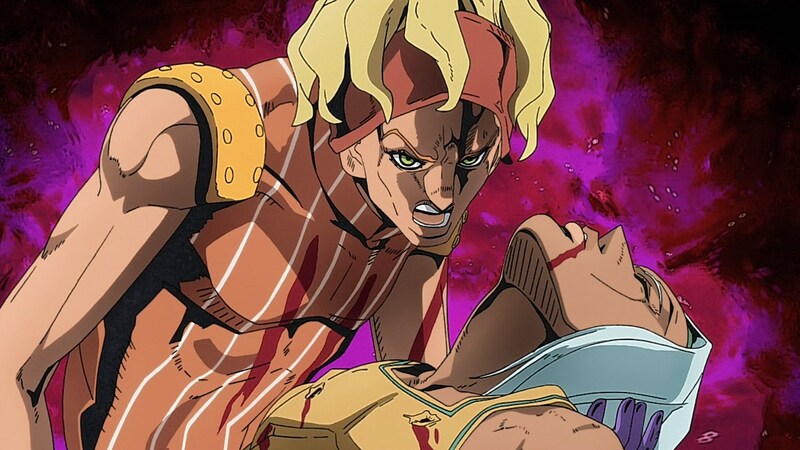 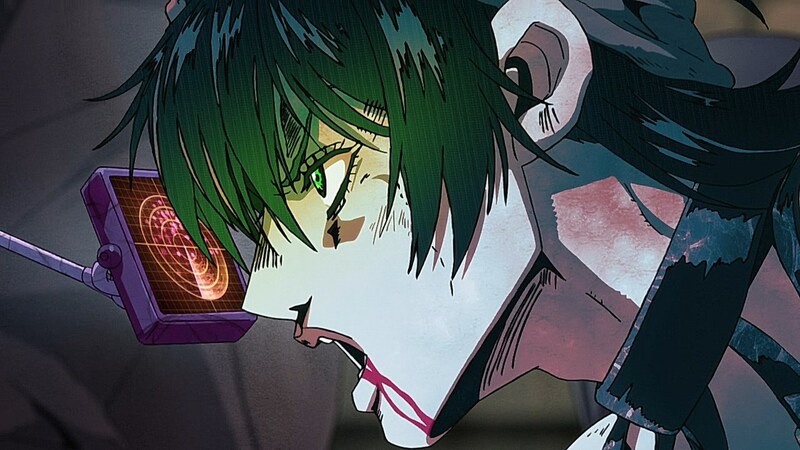 Instead of fundamentally changing himself, Squalo uses his thirst for revenge to cast aside the Boss so that he can kill Narancia and the rest of Passione not for his profession, but for his partner. 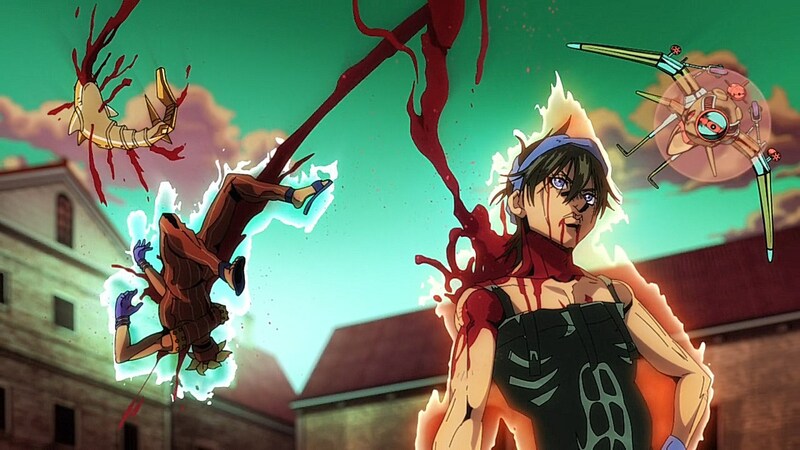 It doesn’t pan out for either of the two, but it is interesting to see how a stand battle would work where a couple works together to fight their opponent. 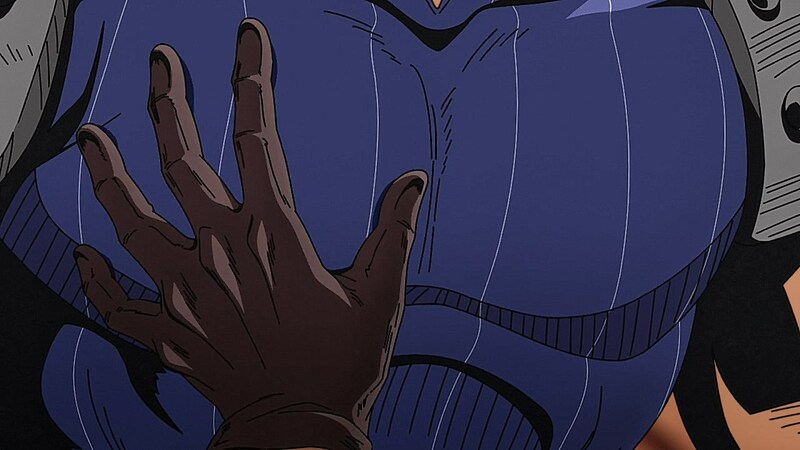 Next time around, we have quite a treat prepared for us with the appearance of Notorious B.I.G. 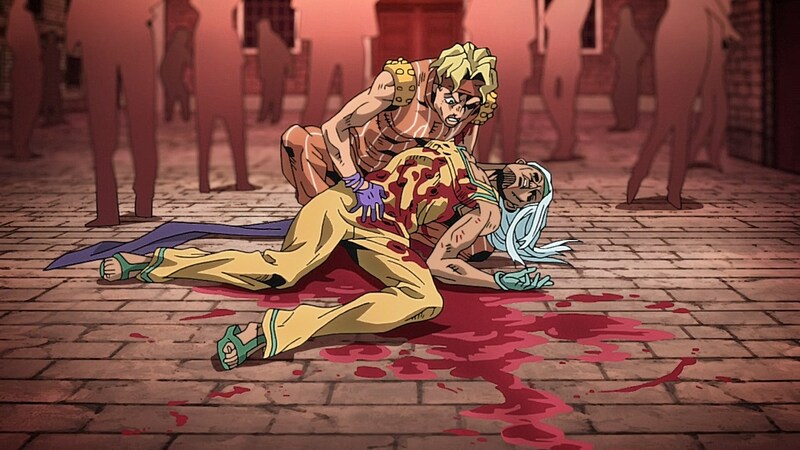 F for the Unambiguously Gay Duo.